State House Speaker Joseph Souki on Wednesday called for bold shifts in tax policy, urging the state to give the counties a greater share of hotel room tax revenue, collect taxes on Internet commerce and impose a pension tax on wealthy seniors. Souki suggested raising the $93 million annual cap on hotel room tax revenue that goes to the counties to $141 million, perhaps over several years, a recognition that the counties cover police, lifeguard, parks and other services used by tourists. Star-Advertiser. 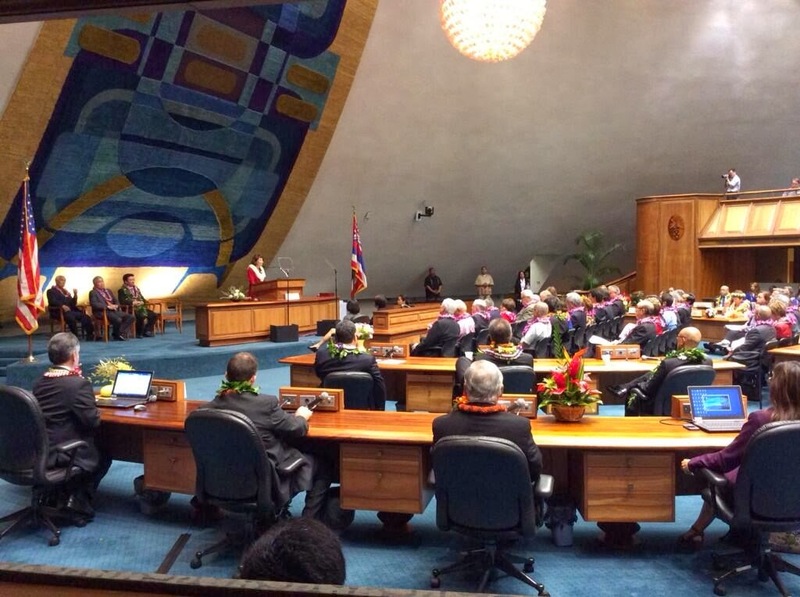 The Hawaii Legislature opened its 2014 session Wednesday with lei and speeches, and by recognizing former representatives and senators, including Gov. Neil Abercrombie, former Gov. John Waihee and Honolulu Mayor Kirk Caldwell, in honor of 55th anniversary of statehood. Pacific Business News. The Legislature convened for its 27th session today, with both Houses honoring more than 80 former lawmakers who served since Statehood 55 years ago. Hawaii Public Radio. The 28th session of the State Legislature opens with several proposals that may impact your pocket book. KITV4's Andrew Pereira has more on what topics made the most impact on the House's first day. KITV4. Hawaii House Speaker Joseph Souki started the 2014 legislative session Wednesday by calling for lawmakers to remove a cap on how much counties can share in the state’s hotel room taxes, a move that would be welcomed by mayors on the islands. Associated Press. If House Speaker Joseph Souki has his way, Hawaii could be the next state to allow marijuana dispensaries for residents using the drug for medicinal purposes, following a national trend to loosen laws restricting access to cannabis. More than 12,000 residents take advantage of the Hawaii law that allows people to use marijuana for medical reasons, but patients have to grow their own weed. Civil Beat. Shops selling pakalolo. State House Speaker Joe Souki says it's the next step given Hawaii's medical marijuana law, and not to raise state revenue. KHON2. The University of Hawaii told lawmakers Tuesday it needs $33.5 million to replenish tuition revenues that have been used to cover salary restorations and increases in a six-year faculty contract. In return, the university promises to dedicate about half of the money to debt service on revenue bonds to start tackling the university's massive repair backlog. Star-Advertiser. It's difficult to picture Donna Mercado Kim as a little girl, riding a bicycle and drinking water from a garden hose. And yet, there was the Senate president waxing nostalgic at the Capitol today about Hawaii's past, a time before PlayStation and bottled water. She was inspired by the presence of 40 former state senators who were honored on opening day of the 2014 Legislature. Civil Beat. Rising Waters, Stinging Ants and GMOs Top Legislative Environmental Priorities. Civil Beat. Minimum Wage, GMOs and How to Spend $844 Million Surplus, Will Take Center Stage at Legislative Session. Hawaii Reporter. Today was opening day at the Hawaii State Legislature. Hundreds came to the Hawaii State Capitol to pound kalo into pa‘i ‘ai and poi. Hawaii Independent. As Senate and House leaders proposed ways to propel the state toward a more prosperous future, a hui of community groups rang in the 2014 legislative session by gathering in the Capitol courtyard to honor the past by continuing one of Hawaii's most-revered ancient practices: pounding taro into poi. Until 2011, producing and consuming handmade poi was illegal because it violated Department of Health food safety laws, event coordinator David Anthony said. A law passed that year exempted hand-pounded poi, or paiai, from those laws. Star-Advertiser. Hawaii’s four mayors stood together before the House and Senate money committees Wednesday afternoon in the Capitol Auditorium and asked the Legislature to give the counties a broad new taxing authority. But the reaction from state lawmakers suggests their plea for the power to raise the General Excise Tax by as much as 1 percent will not pass this legislative session. Civil Beat. Speaker Souki Calls on House to Create Opportunities for All. Creating a Better Day for Hawaii - Senate Minority Opening Day Speech. Opening Day Remarks by House Minority Leader Aaron Ling Johanson. Navy officials said Wednesday night they're investigating a possible fuel leak in a tank at an underground facility built in Hawaii in the 1940s. Associated Press. Federal Authorities are taking the city to task for delays in spending $8 million in federal housing money. In a Dec. 13 report, the U.S. Department of Housing and Urban Development said the city may have to repay the money if it's unable to spend the money this year. Hawaii News Now. Opposition is building to plans from Los Angeles-based PACREP LLC to construct a second tower in its Ritz-Carlton Waikiki Beach Residences complex — an addition the developer and proponents say could bring a much-needed boost to an aging and constrained tourist destination. Star-Advertiser. House lawmakers are peeved over a public service announcement they say is aimed at pressuring the Legislature to fund the controversial pharmacy college building at the University of Hawaii at Hilo. Gov. Neil Abercrombie's proposed budget includes $28 million in state-backed bonds for the Daniel K. Ino­uye College of Pharmacy building, and state Budget Director Kalbert Young has said the project is a top priority for the administration. Star-Advertiser. Hawaii County Mayor Billy Kenoi has a laundry list of projects he wants the state Legislature to consider during the 2014 session that began Wednesday. But he emphasized at a hearing of the Senate Ways and Means and House Finance committees that the projects he’s outlined are the responsibility of the state, not the county. West Hawaii Today. Last legislative session, Maui's lawmakers were able to secure more than $300 million in funds for various initiatives on-island, including $130 million for a long-awaited Kihei high school, $20 million for the acquisition of Lipoa Point and millions more in airport and harbor improvements. Maui News. Kauai’s largest agricultural companies have shared how much restricted use pesticides they applied in December. Garden Island. A County Vehicles Audit Report says the county needs to improve how it monitors, reports and authorizes employee vehicle use. Garden Island.